When my Aunt Rose told me that she was a Roman princess I believed her. She wore plum lipstick, after all, and cashmere sweaters. 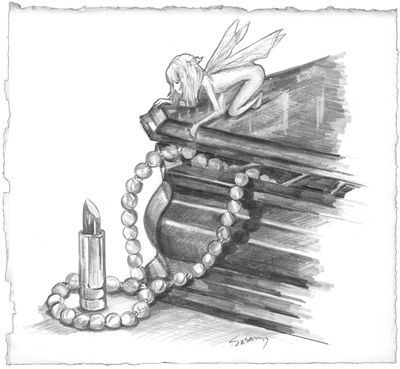 She had milk-white skin, jet black hair and a jewelry box full of pearls. Years later I learned that my Grandmother’s maiden name wasn’t really a misspelling of Caesar. Cecere means chickpea. If my aunt knew, she didn’t say. She stuck to her story and I became enchanted with the notion that a kingdom awaited us in some faraway land. I count this as my first brush with magic. According to Webster, to enchant is to ‘influence as if by charms and incantations’. Words make stories and stories, told often enough, take on lives of their own. The stories I grew up with shaped me. What I love now is what I loved then…adventure, mischief and Magic. I grew up in the fifties and sixties. We listened to fairytales at bedtime and watched the Disney interpretations of these same stories in the movie theaters. We had Robin Hood and the Mickey Mouse Club on TV. My childhood was populated with mythic characters like Davy Crockett, Daniel Boone and Paul Bunyon and with fairytale pals like Snow White and Briar Rose. But once I could read, everything changed. No longer saddled with Disney’s version of dwarves and witches, I was free to imagine my own. Books transported me out of the everyday world and deposited me smack in the middle of Sherwood Forest. I joined the Merry Men and learned to shoot a longbow. I traversed time and space, fell down a rabbit hole and rode my jet black courser across the English countryside. Books lifted me out the role of ‘watcher’ and plunged me headlong into the action. I became voracious. I devoured encyclopedias and dictionaries as well as novels. I now had access to Thomas Hardy’s England, Robert Heinlein’s outer space and Tolkien’s Middle Earth.I fell in love with words. When I was about thirteen I went to a party at the Jersey shore with some friends. Being somewhat socially inept, I found a quiet room away from the action and zeroed in on the bookshelf. There, as fate would have it, I discovered the Red Fairy Book by Andrew Lang. Here were folktales from all over Europe, from Russia, the Netherlands and Romania. I’d stumbled upon treasure and gotten my first glimpse into the deep well of storytelling that lay beneath the versions I grew up with. I credit my parents for instilling in me a love of learning, my extended family for filling my head with stories. Our house was full of books, our family gatherings noisy with laughter. But I would be remiss if I didn’t mention ‘place’ in having an enormous influence over my imagination. In a novel, setting is bedrock. A frame. Think ‘the Old Man and the Sea’ or ‘To Kill a Mockingbird’. In real life I think places act on people in ways that aren’t immediately apparent. We lived in Massachusetts when I was very young, then in Utah. We drove to the Cohasset beaches through sandy scrub-hills and played on the rocks near the water. The pinewoods of Cohasett live in my memory as an extension of Sherwood Forest, the boulders on the beach as my first encounter with dragons. When my father drove us across the Mohave desert from Salt Lake City to LA, I saw red dirt and red rock and the stark dun beauty of the desert. I saw cobalt skies, brown hills and open space. And I felt that awe you sometimes feel if you’re lucky enough to find yourself alone with the raw beauty of the world. The images of the American southwest have insinuated their way into my paintings. And I guess my childhood companions have found their way into my writing. I’ve conflated the mysteries of nature with my love of Faerie, but a person could do worse. I love stories with deep roots and reckless heights, stories that amaze and surprises and instruct the soul. I think stories should change us. Life certainly does. After all, life is the ultimate ongoing tale. I became a parent before I was actually done being a child. My daughter finished raising me. Under her expert guidance I discovered that the limits of my skills and endurance were far greater than I had ever imagined. I also discovered my endless capacity to love. This was perhaps the greatest gift, because now I know what to write about. I thank her for that. I thank my relations for their wisdom and humor, and for whatever genetic imprint they traced on my heart that instilled in me need to write things down.